Enjoy these amazing platinum facts. Platinum is a precious metal that is used in catalytic converters, jewelry, watches, as a currency and lends its name to credit cards and music awards. Find out more about platinum and its properties by checking out our interesting facts below. Platinum is a chemical element with the symbol Pt and atomic number 78. The name platinum comes from the Spanish word 'platina' which means "little silver". Platinum is a dense, malleable (can be thinned), ductile (can be stretched), shiny gray-white transition metal that is rare enough to be deemed a precious metal. Platinum can be found chemically un-combined in its native form. Because of this pre-Columbian South American natives used platinum found in the alluvial sands of various rivers to produce artifacts of a white gold-platinum alloy. Platinum was first mentioned in European writings by Italian Julius Caesar Scaliger in 1557. He described an unknown noble metal found near Mexico, "which no fire nor any Spanish artifice has yet been able to liquefy." The melting point of platinum is 3,215 °F (1,768.4 °C) and the boiling point is 6,917 °F (3,825 °C). Native deposits of platinum are rare and difficult to locate, South Africa accounts for 80% of the worlds production. Alluvial deposits are also mined from the Ural Mountains, Russia. Platinum can also be produced commercially as a by-product of nickel refined from copper and nickel ores. Nearly half of all platinum produced is used in catalytic converters, these are devices which control harmful vehicle emissions. Platinum's resistance to tarnish and corrosion as well as its silver-like shine and extreme rarity make it ideal for making jewelry (its second largest usage). Watchmakers such as Vacheron Constantin, Patek Philippe, and Rolex, use platinum for producing limited edition watch series. 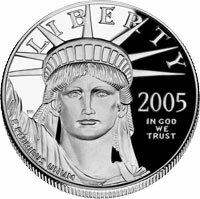 Like the other main precious metals gold and silver, platinum is used as currency and investment. The commodity is traded and collected in the form of coins, bars, ingots and jewelry. Other uses of platinum include in oxygen sensors, spark plugs, turbine engines dentistry equipment and dental crowns, as an anti-tumor agent, to make standard weights and measures, and to make powerful magnets. Platinum's rarity as a metal means the word is often associated with wealth, value and exclusivity making it a very marketable word widely used by advertisers. "Platinum" awards, credit cards and music album sales are seen as of a higher rank than "gold", "silver" and "bronze" but lower than "diamond". Meteorites and our moon have a higher percentage of platinum than Earth.